A light snow falls in Greenville Thursday. A winter storm, carrying with it a possible 4 to 8 inches of snow, and including ice and sleet, is expected to hit the area Saturday. Road crews have plans in place to help keep roads and streets driveable. DARKE COUNTY — A winter storm is expected to hit the region this weekend, bringing with it potentially hazardous road conditions. WDTN-2 Meteorologist Jamie Jarosik said the region should expect a mix of freezing rain, sleet and snow early Saturday morning, changing to all snow throughout the day. “A significant winter storm will impact the region over the weekend. All kinds of winter precipitation will be likely. It will be very windy and turn much colder Saturday night and Sunday,” she said. 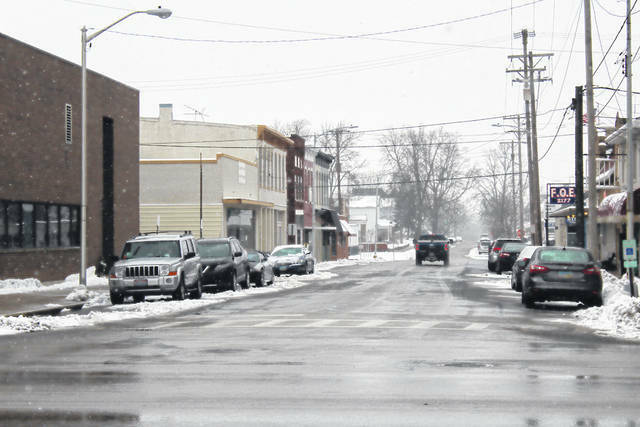 Overall, the area is expected to receive 4 to 8 inches of snow Saturday, with daytime temperatures dropping into the teens Sunday and falling subzero overnight. With the possibility of significant snow and ice accumulation, state, county and city road crews are formulating plans to keep area roadways driveable. Ohio Department of Transportation Public Information Officer Mandi Dillon said ODOT crews have been monitoring the weather and checking their equipment to make sure everything is running properly. Darke County Engineer Jim Surber said county road crews are ready for the weekend weather. Greenville Street Department Superintendent Ryan Delk said his department will be at full staff this weekend, with additional help on call if needed. This entry was tagged Freezing rain, Greenville Street Department, ODOT, Ohio Department of Transportation, Sleet, Snow, Snowplow, storm, weather, winter. Bookmark the permalink.